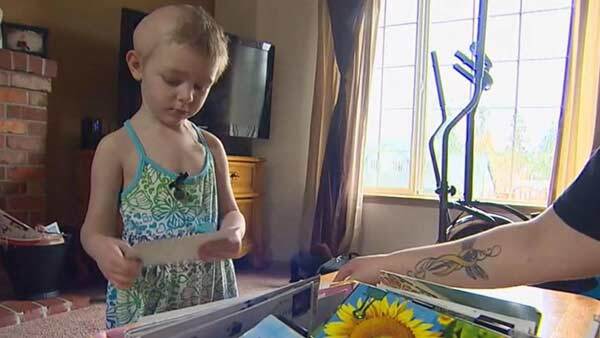 The family of a 3-year-old girl with brain cancer said the simple act of getting mail is helping brighten her day, ABC News reports. Ellie Walton was diagnosed with a brain tumor at just 4 months old. Now 3 years old, she's been through at least 13 brains surgeries, according to her mother, Sarah Walton. The toddler is currently battling glioblastoma multiforme, a deadly form of brain cancer. In the last few months, Walton said the family has discovered an usual and unexpected way to cheer up Ellie: postcards. The tradition started when Walton's grandparents sent Ellie and her older sister Ava a postcard from Arizona and both girls flipped out over the mail. Ellie's postcard had a picture of a donkey on it and her mother said "she thought it was the coolest thing to get a donkey in the mail." Soon, the girls started asking for more postcards from across the nation, though Florida was a specific state of interest, Walton said. "I started asking people to send postcards. It was a few postcards here and there," Walton recalled. When she put a request on the Facebook page she uses to update people on Ellie's condition the response was immediate. Walton said the family has received so many that her older daughter Ava wants to put them all over her walls. She said they show Ellie her postcards every night after they pick them up from the post office box. Ellie can't leave the house because her cancer treatment has weakened her immune system, Walton said. They've received cards from 47 U.S. states and even foreign countries, including Germany. "She's on lock-down inside the home. I will have them brought to me and me and my husband will lay them out," Walton said. "It raises her spirits and we read every single postcard to her." Ellie has a few favorites, especially if they have dolphins on them, Walton said. "The girls play with them like they're toys almost," Walton said, noting that the postcards have been a way to raise the spirits of the entire family. "Everybody posts something on the card and everything on the card touches my heart," Walton said. "It's another prayer for her." Ellie is currently on two different kinds of chemotherapy and she will likely stay on them for the next year, Walton said, noting that the family is planning to go to Hawaii to see dolphins up close as part of Ellie's "Make-A-Wish" trip.